Ravenous is a 1999 Western horror film directed by Antonia Bird and starring Guy Pearce, Robert Carlyle, Jeffrey Jones and David Arquette. The film revolves around cannibalism in 1840s California and some elements bear similarities to the story of the Donner Party and that of Alferd Packer. Screenwriter Ted Griffin lists Packer's story, as recounted in a couple of paragraphs of Dashiell Hammett's The Thin Man, as one of his inspirations for Carlyle's character. The film's darkly humorous and ironic take on its gruesome subject matter have led some to label it simply as a black comedy or a satire. The film's unique score by Michael Nyman and Damon Albarn generated a significant amount of attention. The film's production did not get off to a good start, with the original director Milcho Manchevski leaving the production three weeks after shooting started. He was replaced by Bird at the suggestion of Carlyle. During the Mexican–American War, Second Lieutenant John Boyd, who is fighting in the United States Army, finds his courage fail him in battle and plays dead as his unit is massacred. His body, along with the other dead are put in a cart and hauled back to the Mexican headquarters. However, in a moment of bravery, Boyd seizes the chance to capture the Mexican headquarters. His heroism earns him a captain's promotion, but when General Slauson learns of the cowardice through which victory was achieved, he posts Boyd into exile at Fort Spencer, a remote military outpost high in the Sierra Nevada commanded by the weary but genial Colonel Hart, and staffed by a motley array of misfits; the pious Private Toffler, the drug-addicted Private Cleaves, the drunken Major Knox and the ferocious Private Reich, in addition to the Native American scout George and his sister Martha. Shortly after Boyd joins the garrison, a frostbitten stranger named Colquhoun arrives and describes how his wagon train became lost in the mountains, telling a hellish tale. A Colonel Ives had promised the party a shorter route to the Pacific Ocean but instead had led them on a more circuitous route resulting in the party getting trapped by snow for three months. Wracked by starvation, he and his fellow travellers were reduced to cannibalism, and he alleges that Ives has resorted to murder. A rescue party is assembled to get the survivors. But before they leave, they are warned by George of the Wendigo myth: anyone who consumes the flesh of their enemies takes their strength but becomes a demon cursed by an insatiable hunger for more human flesh. When the soldiers reach the party's cave, Boyd and Reich investigate. Once inside they discover the bloody remains of five skeletons, and realise that it was Colquhoun who murdered everyone in his party. After eating his five companions, his plan is now to kill and eat the soldiers. Colqhoun quickly kills George, Toffler and Colonel Hart, and after a brief struggle Reich. Boyd escapes the massacre by jumping off a cliff but breaks his leg. He hides in a pit next to the body of Reich, whom he eventually eats to stay alive. When Boyd finally limps back to the fort, he is delirious and severely traumatized, and returns to find that it has been reinforced by General Slauson and a detachment of cavalry. Cleaves and Martha (who were on a supply mission and had not met Colqhoun) do not believe his wild tale, while the hung-over Knox cannot recall and refuses to back Boyd up. A second expedition to the cave finds no bodies or any trace of the man. A temporary commander is assigned to the fort but to Boyd's horror, it is Colquhoun, who has disguised himself as the murdered Colonel Ives. The men still refuse to believe Boyd because Colquhoun bears no sign of the wounds inflicted on him during the fight at the cave. Secretly, Colquhoun tells Boyd that he used to suffer from tuberculosis but when a Native scout told him the Wendigo myth, then he "just had to try" by murdering him and eating his flesh, a process that cured his disease. Colquhoun now plans to use the fort as a base to cannibalise passing travellers because, like the notion of Manifest Destiny, the migrants had a calling just like himself. Boyd is soon suspected of murder after Cleaves is mysteriously killed. While chained up, he watches helplessly as Knox is murdered by Colquhoun's' unexpected ally: Colonel Hart, back from the dead after the massacre. Colquhoun saved Hart by feeding him his own men in order to gain his assistance. But like Colqhoun, he is now hopelessly addicted to human flesh. Colquhoun mortally wounds Boyd, forcing him to make a choice: eat or die. Eventually Boyd gives in and eats a stew made from Knox. However, rather than join the two men in their conspiracy to convert General Slauson, Boyd convinces Hart to free him so he can kill Colquhoun. Hart does so but asks to be killed because he no longer wants to live as a cannibal. Boyd and Colquhoun fight, inflicting grievous wounds on each other, as their recuperative powers sustain them. Eventually, Boyd forces Colquhoun into a large bear trap that pins them both together. Colquhoun taunts Boyd by telling him that he will eat him, but soon dies. General Slauson returns, and while his aide looks around the dilapidated fort, the general tastes the meat stew left simmering on the fire. Martha sees Colquhoun and the dying Boyd together, closes the door, and walks away. Boyd does not eat Colquhoun and dies. The film was shot on location in the Tatra Mountains, Slovakia and Durango, Mexico. One week before production, original director Milcho Manchevski was said to have submitted new storyboards, which would have required additional two weeks of shooting. The production company, Fox 2000, eventually agreed to an additional week, with complaints that Manchevski had refused production meetings with the producers. Meanwhile, Manchevski complained Fox 2000 executive Laura Ziskin micromanaged the production by vetoing his chosen technicians and casting against his wishes. Shooting was delayed on the first day as Manchievski and the production were still negotiating over the production budget and shooting schedule. As filming commenced, Manchevski says Ziskin sent him notes on the rushes "every day", complaining about the amount of dirt on the costumes and the number of closeups. Screenwriter Ted Griffin was at hand for "constant rewrites" during the shooting. After three weeks of shooting, Ziskin arrived to the set with director Raja Gosnell in tow to dismiss Manchevski and place Gosnell in as a replacement. While Manchevski left the production, the cast has been said to have rejected Gosnell. Robert Carlyle then recommended Antonia Bird, his frequent collaborator and business partner, to take over. Following ten days of negotiations, Bird arrived in Prague to helm the production. She, too, would criticize the circumstances under which the filming was to take place, describing the allocated studio space as "horrible" and the scheduling of the shoot "manipulative". She also went on to say her predecessor, Manchievski, should not be blamed for the problematic production. Bird suggests the final theatrical cut had elements introduced without her approval, as she expressed disdain over the voiceover narration and was interested in recutting the film for the European market. This would be the last theatrical release to feature John Spencer, who would commit to his role as Leo McGarry full-time on the TV series The West Wing, before he died in 2005. Ravenous opened on 19 March 1999 in the United States in 1,040 cinemas, accumulating $1,040,727 over its opening weekend. It finished eighteenth for the weekend. The film went on to gross $2,062,405 in North America, far less than its reported $12 million budget. On Rotten Tomatoes, the film has a 45% rating based on 46 reviews with an average rating of 5.61/10. The site's critical consensus reads "Ravenous tries bringing cannibal horror into an Old West setting, ending up with an uneven blend that will fail to satisfy most fans of either genre". Roger Ebert rated the film 3/4 stars and stated that it was "the kind of movie where you savor the texture of the filmmaking, even when the story strays into shapeless gore." Additionally, Michael Smith of White City Cinema ranked it as his 21st favorite film of the 1990s. ^ Ehrlich, David; Ehrlich, David (27 October 2015). "Why 'Ravenous' Is the Greatest Cannibal Western Ever Made". 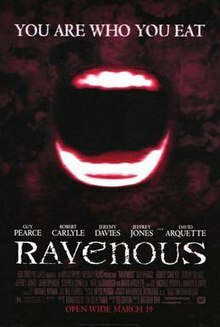 ^ "FANGO Flashback: "RAVENOUS"". Fangoria.com. Retrieved 29 August 2017. ^ "Ravenous (1999)". IMDb.com. Retrieved 29 August 2017. ^ "Ravenous (1999)". Box Office Mojo. Retrieved 2007-05-14. ^ "Ravenous". Rotten Tomatoes. Retrieved 2007-05-14. ^ Ebert, Roger (1999-03-19). "Ravenous". Chicago Sun-Times. Retrieved 2007-05-14. ^ "Ravenous - White City Cinema". whitecitycinema.com. Retrieved 29 August 2017.